This tutorial will guide you through the concept of Selenium Webdriver waits (Implicit and Explicit Waits) and how to use them in Python. If you are doing automation in Selenium Python and wish to write error-free scripts, then you must learn to use waits. They let you handle any unexpected condition which may occur. While automating a web application, you intend to write a script which can execute the following tasks. Click here to Go Back to main Selenium Python tutorial. However, the test script could sometimes fail due to the following reasons. The web element was not present as it could not load due to the runtime issues. The usage of AJAX techniques in the web applications has introduced uncertainty in the sense that loading of the web page and the web elements present in it may happen at a different time span. Many times, due to peak traffic or network latency, our application may behave differently than it does at normal, optimal conditions. In these cases, we need to wait for the time to allow the web elements to load completely, before using them in our tests. Webdriver API provides two types of wait mechanisms to handle such conditions. We will discuss these wait conditions one by one in detail. An implicit wait directs the WebDriver to poll the DOM for a certain amount of time (as mentioned in the command) when trying to locate an element that is not visible immediately. The default value of time that can be set using Implicit wait is zero. Its unit is in seconds. Implicit wait remains associated with the web element until it gets destroyed. Follow the below coding snippet illustrating the use of Implicit wait in Python. In the above code, the implicitly_wait( ) method tells the Webdriver to poll the DOM again and again for a certain amount of time. The timeout in this example is 100 seconds which will trigger if the target element is not available during that period. We define Implicit wait for a Webdriver object so it will remain active until the existence of that object. There may be scenarios when the wait time is uncertain. Explicit waits work as a savior there. Here we can define certain conditions, and Selenium WebDriver will proceed with the execution of the next step only after this condition gets fulfilled. The explicit wait is the most preferred way of implementing Selenium webdriver waits in a test script. It provides the flexibility to wait for a custom condition to happen and then move to the next step. 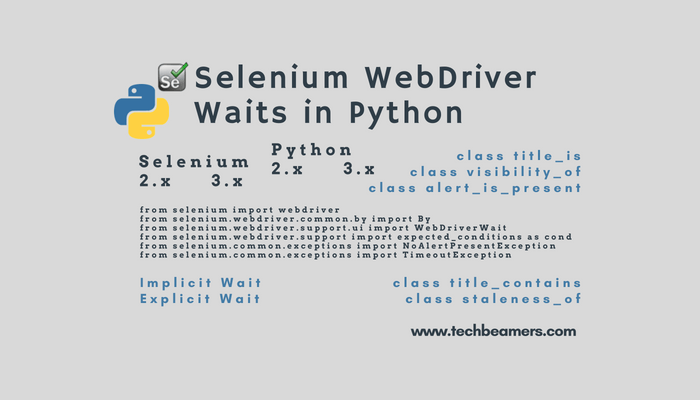 Following are the two Selenium Python classes needed to implement explicit waits. Expected Conditions class of the Python. Press button underneath to generate an alert. Following is the code snippet demonstrating the Explicit wait. #location = "file://<Specify Path to Simple_Alert.HTML>"
In the above script, the timeout value is 10 seconds. It means the Webdriver will wait for 10 seconds before throwing a TimeoutException. If the element is present, then it may return within the 0 – 10 seconds. By default, the WebDriverWait API executes the ExpectedCondition every 500 milliseconds until it returns successfully. If the ExpectedCondition matches, then the return value will be a Boolean (TRUE) whereas a non-null value for all other ExpectedCondition types. There are a no. of standard conditions which you may commonly encounter while automating the web pages. Below is the list displaying the names of each of them. All of these classes are available in the “selenium.webdriver.support.expected_conditions” Python module. It allows waiting for an alert to appear. It allows waiting for an element to locate having a specified state. It allows waiting for an element to locate in the selected state. It allows waiting to find an element having a specified state. It allows waiting for an element to locate which is in a clickable state. It allows waiting for an element to find which is in a selected state. It allows waiting for a frame to become available for the switchover. It allows waiting for an element which is invisible or not in the DOM. It allows waiting for an element getting removed from the DOM. It allows waiting for an element to find with a given text. It allows waiting for an element to find with a given text inside the locator. It allows waiting to find a title containing the specified text in a case-sensitive format. It allows waiting to find a title matching the exact specified text. It allows waiting to find an element which is functionally visible. It allows waiting to find all functionally visible elements the specified locator will return. It allows waiting to find at least one functionally visible elements the specified locator will return. It allows waiting to find a specific and functionally visible element the specified locator will return. In Selenium Python binding, you can easily find methods to handle these. It saves you from writing any user-defined expected condition class or creating a package for the same. Understanding of Selenium Webdriver waits is a key to produce high-quality automation test scripts. We hope this tutorial would have directed you to the right approach.